It's been a while since I've written a review of Injustice: Gods Among Us. This is not because my love for this comic has diminished but because I feared becoming repetitive. I can only say so many nice things so often. And I figured that by this point, if you're not already reading this book, nothing I could say or show you could possibly persuade you to give this book a shot. And yet, this time, I've decided to break my silence regarding this issue, which opens with a Black Canary/Harley Quinn catfight and quickly becomes something much deeper. With this issue, Tom Taylor brings forth more depth and personality than either of these two heroines have seen in their respective New 52 incarnations. And it goes far beyond the common link they share as women who've lost the men they love to an increasingly corrupt Superman. I can't say more than that without spoiling too much, but fans of Gail Simone's Birds of Prey may find themselves checking the title page to make sure that Gail didn't write this issue. 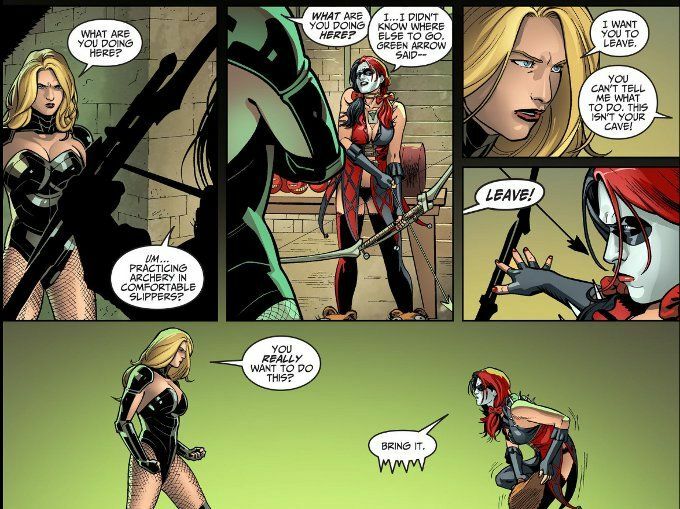 Taylor's take on Dinah Lance is that true to form and his script is reminiscent of Simone's more comedic superhero stories while retaining much of the same heart. The artwork by Bruno Redondo and Julien Hgonnard-Bert is as good as the script. We do get a bit of male-gaze in the early part of the issue, but I believe this to have been a part of the twist - that what seemed to be a fairly standard comic with two scantily clad women beating each other senseless should quickly turn around into a story that seems more appropriate to the Lifetime Network than Spike TV. Bottom Line: If you're a fan of the classic Harley Quinn or Black Canary, you should pick up this issue.